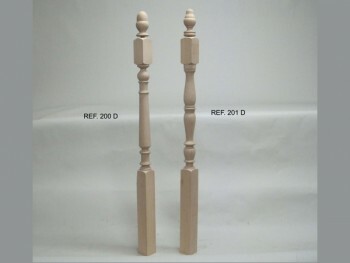 Staircase Baluster reference 200 measurements 90 x 4.5 x 4.5 cm Available in 4 different types of wood. Pine, Beech, Sapelly, Oak. 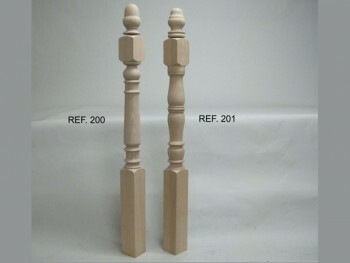 Staircase Baluster reference 201 Measurements 90 x 4.5 x 4.5 cm Available in 4 different types of wood. Pine, Beech, Sapelly, Oak. Newel post 9 x 9 cm. Newel post, we manufacture them in different types of wood, measurements 110 x 9 x 9 cm with a pineapple shape finish included. There are two different models. Newel post 7 x 7 cm. Newel post, we manufacture them in different types of wood, measurements 110 x 7 x 7 cm with a pineapple shape finish included. There are two different models.